In today’s article in our ongoing series on how to make money online, we’re taking a closer look at sites that pay right away. That’s right, you can make fast cash online – or bonus points, contest entries, or other perks – just for signing up or completing a simple action as a new member. Free money sounds great, right? Well, don’t dive in just yet. Here are a few things you’ll need to be aware of before you start creating your accounts, and making money from the comfort of your couch. To create memberships, most sites require a valid email address, and usually, a verified PayPal account. Most sites have a monetary threshold you’ll need to hit before you can cash out your account. Some thresholds are higher than others, and some are as a low as a $1, so if getting fast cash is important to you, you’ll need to look closely at each sites’ guidelines before you get started. When you get paid can also vary – some sites will let you cash out whenever you hit the threshold and others only pay according to a pre-set schedule, i.e. the 15th of every month. Some sites offer gift certificates to national chain stores and websites like Walmart and Amazon, rather than paying out cash. These can be a great option if you already shop at these stores frequently. The tasks you’ll be asked to complete will vary from site to site – but common tasks are reviewing products or websites, sharing your opinions on specific brands, watching videos, playing games, shopping online, downloading apps or even simply allowing companies to track your web usage. There’s nothing to say you can’t sign up at several of these sites – or even all of them! – and get to know what each of them offers. In fact, if you’re serious about earning money online, you should experiment with as many of these sites as possible to find the ones that suit you best. Then, get started and make some money! Opinion Outpost is a great site to earn money for just giving your opinion. All you have to do it is get paid to fill out online survey and there are cash, gift cards and even larger prize drawings. This is one of the best and easiest ways to make money online and it is completely free to sign up. Permission Research is a well known online market research community with over 2 million members worldwide. After you join, you can be part of shaping the future of the Internet. You’ll also have the opportunity to share your opinion by taking surveys. After you join you will be given a win link, for you to win $100,000 in the monthly Your Opinion Matters sweepstakes. Plus, we’ll donate a tree in recognition of your participation through our Trees for Knowledge program. 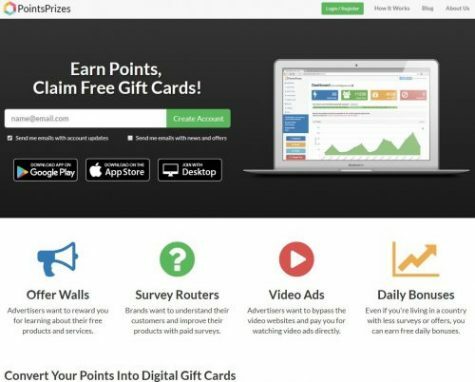 PointsPrizes allows you to earn points with surveys, offers, watching video ads, daily poll and referrals. Choose from thousand of opportunities to earn points. Either complete offers or refer new members, to reach your goal! 10,000+ Paid Surveys, Video Ads & Free Games. Choose From 40+ Free Gift Cards Rewards, Or Free Cash Payments. Save Up Points & Monitor Your Progress. Monitor detailed statistics and formulate your best strategy to earn points. Claim a free gift code, sent to your email. Alternatively choose a direct cash payment via PayPal or Bitcoin! Don’t Miss Out! Start Earning Points Now! Answer surveys, watch movie trailers and check out special offers to win cash back and free gift cards. web’s most popular rewards program that gives you free gift cards and cash for the everyday things you already do online. Earn points when you shop at your favorite retailers, watch entertaining videos, search the web, answer surveys and find great deals. Redeem points for gift cards to your favorite retailers like Amazon and Walmart or get cash back from Paypal. Swagbucks has already paid out over $276,000,462 in cash and free gift cards. Put cash back in your wallet. Join for free today. Try free products, watch ads, and share your opinions on new products with market researchers to earn points you can use towards airline tickets and hotel bookings. If you love to travel, this is an excellent site to sign up with – and they’ll give you Bonus Points when you create your account. Complete online surveys chosen specifically for you to earn points – then trade in your points for cash or gift cards. And you’ll receive a signup bonus of $5 too. This is a survey site with an interesting gamification element. As you complete more surveys, you’ll progress through levels to access better prizes – including vacations and sweepstakes with prizes of up to $1000. Complete your first survey to win 3x the reward points – and you’ll be well on your way to the next level. If you don’t mind giving up a little bit of privacy, this could be the perfect opportunity to add a little cash to your wallet each month. Install the SavvyConnect app on your wired devices and you’ll earn $5 per month, per device. You’ll also be invited to participate in a variety of surveys, based on your personal profile. Read emails, play online games, and take paid surveys to earn cash fast. They’ll give you a $5 signup bonus – and don’t keep a good thing to yourself! You can earn extra points for referring your friends to the site. Get $5 Sign Up Bonus when you create your account, then take surveys, play games and get great deals when shopping online – so you can save money while you make money! If you watch tv, have opinions, or enjoy shopping, try InboxDollars where you can get paid just for doing things you already do. They’ll give you a $5 bonus when you sign up. With Ebates, you can choose your welcome bonus – pick a $10 Walmart Gift Card or an Ebates $10 cash bonus to spend wherever. The sites offers cash back on purchases at a huge range of brand-name websites – if you shop online often, it’s almost guaranteed that you’ll earn money back on your purchases. Ibotta offers cash rebates (no points, just real money) on groceries, mobile shopping, pharmacy purchases and even beer and wine. Choose the products you’re planning to buy from their partner stores, then just upload a photo of your receipt after shopping. You’ll receive a cash rebate in your Ibotta account within 2 days. Sign up today to receive a $10 bonus, and get your friends on board for the chance to make money even faster with teamwork bonuses. Find coupons, get the best prices and receive up to 30% back on your online purchases with Extrabux. All you need to get started is an email address and a password. And if you can get a friend to join too, you’ll receive a $5 bonus when they do. For a limited time, you can get a $10 joining bonus on this cashback/couponing site. They’ve partnered with sites like Target, eBay and Amazon – actually, over 5,000 stores – offering cash rebates and coupon deals that you can combine to save even more money. Join this site for a $10 sign-up bonus and start getting cash back on your online and offline purchases – including gas, travel, and local deals. Save big at the internet’s “largest consignment and thrift store” and get $10 when you create your account to spend on your first purchase. You’ll find amazing deals on gently used clothing and shoes – including designer brands, and the latest trendy fashions. While the CashCrate sign-up bonus is just a $1, they’ve got more than enough opportunities to make a lot more money. Try new products, get cash back on purchases, play games and share your opinions to earn money. You can even earn extra cash when people you’ve referred to the site earn money. They’ve even got a check gallery so you can see how much other users are making with the site. Sign up to get a $5 bonus, then watch videos, join online games, and complete tasks to earn more. You’ll also find discounts on products and services. So there you have it, 15 sites that not only offer plenty of opportunities to earn money for things you already do – but also help you save money too. Looking for even more ways of making money online? Check out our Top 10 Make Money Online Opportunities.